Locomalito's critically acclaimed 2D platformer Maldita Castilla has been renamed Cursed Castilla for its western 3DS release - which is taking place next week on July 13th. It will cost €11.99 in Europe, with the UK and North American pricing still to be confirmed. A retro-tinged love letter to Capcom's Ghouls 'n Ghosts, Cursed Castilla is set in medieval Spain and features a cast of ghoulish monsters to battle. The title has already found fame on PC and Android, and comes to the 3DS with autostereoscopic 3D and an exclusive coin-op mode. Prepare your sword, brave knight, for it is time to fight the dark forces that have this land crushed under its evil grip! 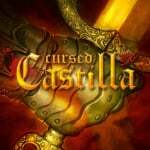 Abylight Studios and Locomalito are excited to announce that Cursed Castilla, the acclaimed indie platformer, will be released for Nintendo 3DS family of systems in North America and Europe on 13th July for 11,99€. Also, the game will be released in Japan by our co-publishers, FlyHigh Works, on 12th July with the same price. With the portable version of this action-platformer, you will be able to enjoy the true experience of the greatest arcade games of all time: straightforward, fast-paced and challenging gameplay – wherever you want, whenever you want! Cursed Castilla for Nintendo 3DS also includes some exclusive features, such as a new coin-op mode or an astounding stereoscopic 3D effect. Inspired by the best tradition of classics such as Ghouls’n’Ghosts, Shinobi or Tiger Road, Cursed Castilla pays homage to them and updates their legacy with its hectic and addictive gameplay, challenging difficulty and intuitive controls. Its unique setting makes it stands from the crowd too: Cursed Castilla takes place in the Kingdom of Castilla, one of the medieval kingdoms that eventually would become Spain. Thus, you won’t face the typical fantasy monsters but creatures from European folklore and legends, as well as from chivalric old romances. Be ready, o valiant warrior, to face creatures such as mouras, ojáncanos or nuberus! Having sampled this game on Android previously we can say already that it's going to be well worth a look - expect a review soon. I thought this was also coming to Switch? Or was that some other G&G homage? @Retron I thought so too. Actually looks good, I think I'd rather try it on android first though if it's free. I'm hoping it comes to the switch. I'll buy it for sure. Looks awesome. @Robotron2084 Crom! Cool profile pic. I was playing the original freeware version on PC! It's rather good, quality through and through! Would buy on Switch, only might on 3DS ~ A good fit for the platform though. Believe it or not, I played this first on the Ouya where it was also free and exceptionally good. At the time, I felt it warranted a cost but with these additions, I'd be more than willing to pay for it on the 3DS. I am still a fan of the system's 3D after all these years and that's a selling point for me for this game. A lot of homages that are making good money... You'd think the actual developers of said titles, that these games are inspired by, would consider making their own official sequels, but nope! So they translate the word 'maldita', but not the name of the place? Castilla is Castille in english. Maybe I'm being pedantic here, but I though the entirely spanish title was kind of cool. @artofmana 3D is a selling point for me too! We're in the minority I think. But I really enjoy it, even if not very game needs it it can really add to the experience when done well. This game is free on PC's and is pretty fun. Played it a while back. @Nomad Do you know the riddle of steel? Day one for me, I have never played in depht a G&G game (I will probably do it for the first time with the Snes mini), but this looks great and a lot of effort was put in this version, I mean it has 3D effect, unlinke for example, Blaster Master Zero on 3DS. I may wait for the price to come down on this one. Why?! I love Maldita Castilla. Cursed is just not the same!! @Retron that G&G homeage. It is call Battle Princess Madelyn. @Pod it was. In fact it was what got me to look at the game. Has anyone played this yet and can attest to the difficulty? Is it blisteringly relentless like GnG? Or does it just play like it? @TossedLlama If I don't know it, Crom will cast me out of Valhalla and laugh at me. @Priceless_Spork awesome... yeah I can almost only make progress in GnG with VC save states so hopefully this gives me some lotion for the burn... Thanks!